At Jurassic Landscaping we can show you how well-made retaining wall blocks can improve your home. Aside from providing aesthetic appeal, retaining walls can help to prevent soil erosion, create garden beds and improve the landscape, particularly on sloping blocks. There are a lot of diverse options you can choose from when it comes to the structure, design and even the base materials of your retaining walls. They can be as simplistic as creating a small garden bed to house and show-off your home-grown plants and flowers, to creating large and grand retaining wall features that act as barriers for your footpaths, walkways and landscape design. Talk to our team about your design options or view our gallery to see some examples. If you need retaining wall construction for your property anywhere in Melbourne, you can rely on the experts at Jurassic Landscaping. Our team of landscaping professionals specialise in designing and creating custom retaining walls features using durable, quality materials, based on your needs. Wall blocks made from timber can provide as much stability as a concrete or rock block retaining wall but with the added benefit of the stunning, natural look you will only find in wood. This popular retaining wall material is highly customisable with different types of timber, colours, designs and finishes available to be applied by our landscapers. Timber is relatively easy to work with, generally more affordable than alternative materials but still provides great durability. Treated timber solutions that are well maintained can comfortable last you up to 20 years or more! 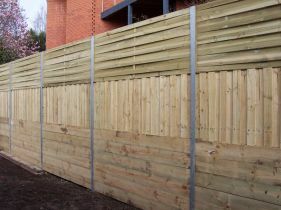 Our timber retaining walls offer excellent functionality. At Jurassic Landscaping, we can show you a wide range of timber products for your retaining walls and provide you with reliable landscaping solutions. When put together professionally, sandstone wall blocks create a beautiful retaining wall that is sure to be a talking point in any garden. With its versatility and natural stone appearance, this option complements many different types of properties beautifully. As they are solid, stone-cut material, sandstone blocks are a practical material choice if your retaining wall is a secure barrier against soil or on a heavy slope. They can also be used in your landscaping to create strong steps alongside your retaining walls. Sandstone blocks are an ideal option for creating sturdy, long-lasting options. Investing in this material can be very worthwhile in the long-term. It is a hassle-free way to increase the value of your property as it will enhance your yard’s visual appeal and will not require frequent repair or replacement, in fact well-maintained sandstone can last you a lifetime! There are options to suit various different budgets and style preferences. 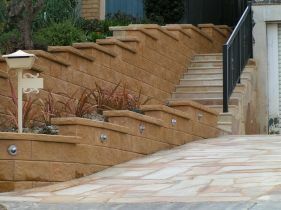 Visit Jurassic Landscaping in Essendon for more information on sandstone and block retaining wall construction. Concrete will last a long time and is a great choice for retaining walls that need extra reinforcing and strength. Our professional team can customise and render your concrete landscaping to your liking. A huge advantage of using concrete retaining wall blocks in your landscaping is their extreme durability. They are a cost-effective option that will last you a very long time as concrete will not rust or suffer damage from surrounding soil and moisture like timber or other natural materials. To learn more about concrete retaining walls, or explore your design options, contact our friendly team of experts at Jurassic Landscaping today. 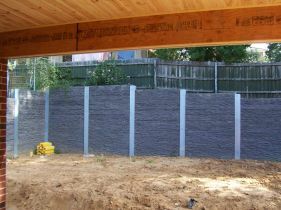 Our retaining wall design and installation services are available Melbourne-wide.